Origin: There is still a lot of ambiguity about the exact origin. Fossils have been found in India and in South America as well. 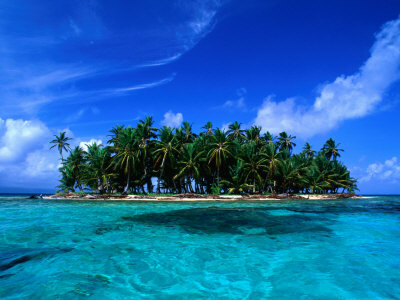 It occurs in all tropical areas of the Pacific Ocean, where it has been distributed both by humans as naturally; as the coconuts can float long distances. 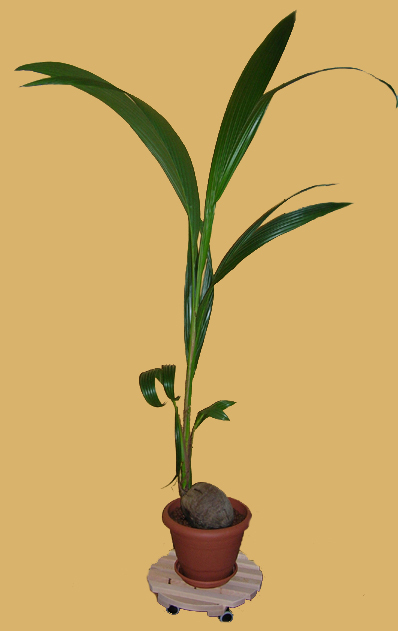 Foliage: pinnate and up to 6 meter (19 ft). 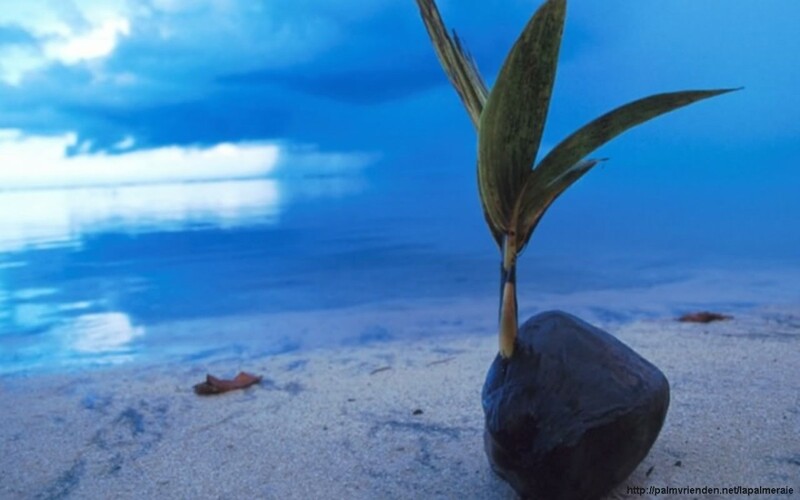 Old leaves are rejected by the palm itself. Fruit: Coconut. 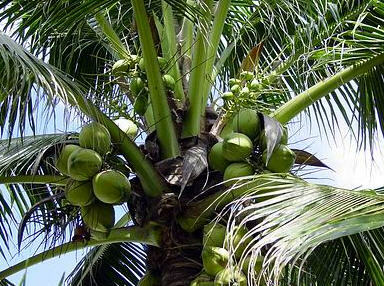 Coconuts sold in our shops had there exocarp (outermost layer) removed and only show the typical brown fibres. The shell has three germination pores or “eyes” that are clearly visible on its outside surface. 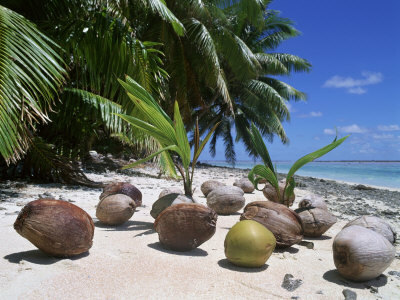 The coconut, which is in fact just one seed is filled with coconut water. Opening the coconut: hit a nail into two of the three eyes and retrieve the coconut water. Put the nut on a solid underground and hit it firmly on its side. The coconut will split apart nicely. Exposure: Full sun, preferably in sandy soil where it is highly tolerant to salt. Lots of water combined with heat and high humidity (70 to 80%) is required for good growth. Sowing is also possible. 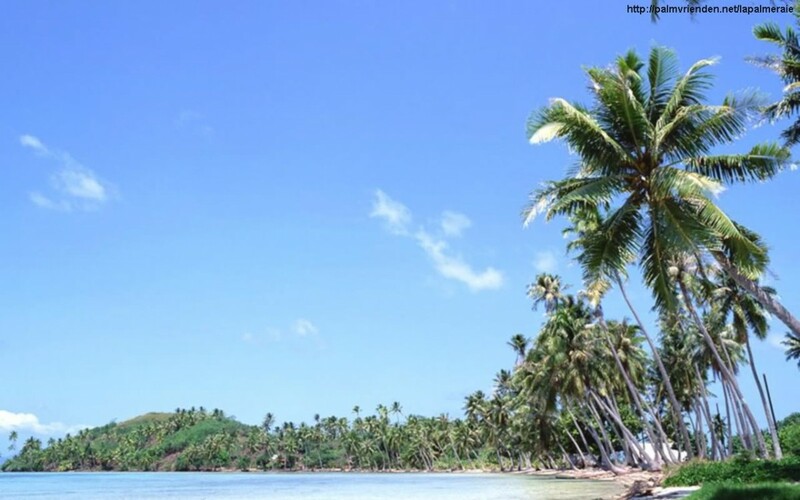 You just need a well-filled coconut to do so. Shake to nut to check if it contains enough fluid inside. Then you only have to put into warm water for a couple of weeks. 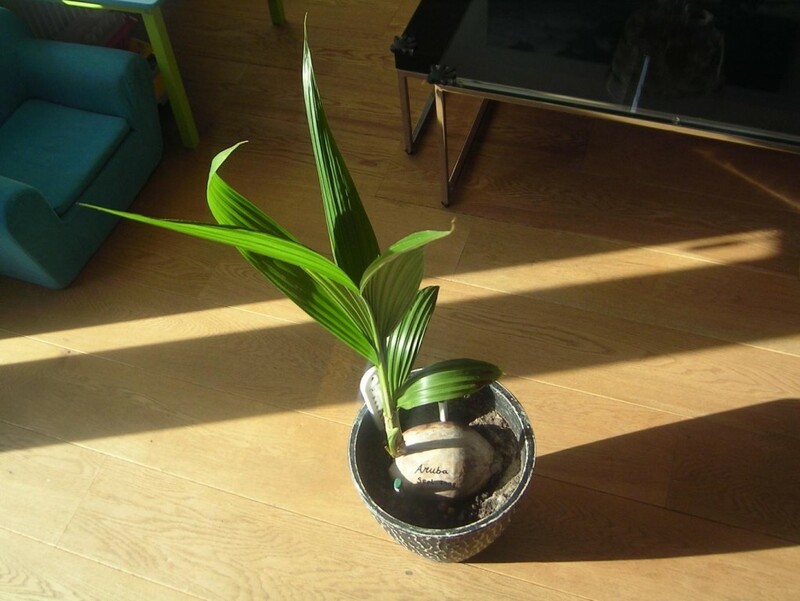 As a potting soil, a substrate of potting soil with 1/5 sand and a little cocopeat + perlite is suitable. 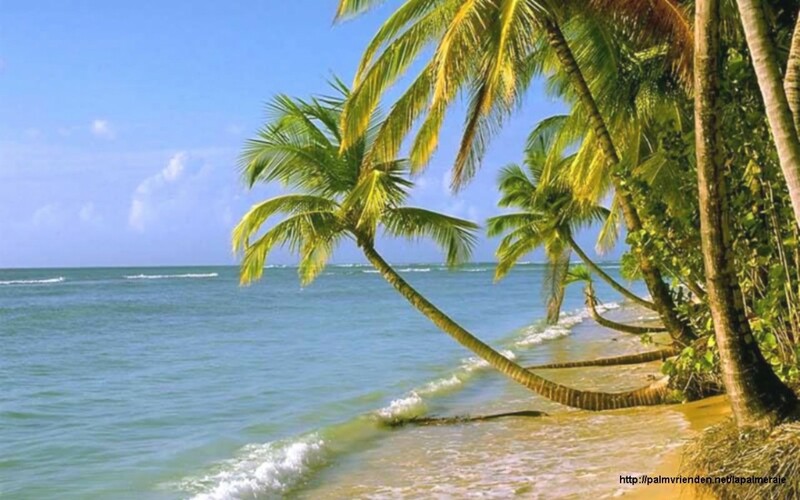 The Coconut palm feeds everyone’s imagination and immediately reminds of paradises with white beaches and a cristal blue seas. 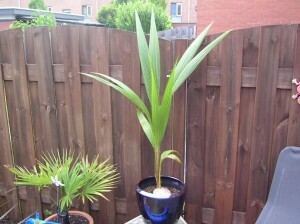 Besides this ornamental value, many parts of this palm are used. 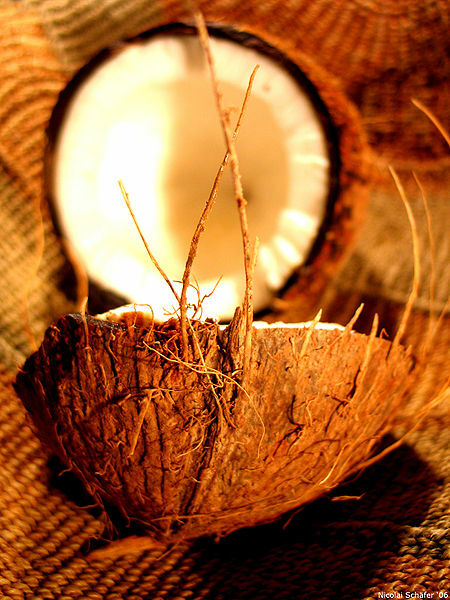 In addition to the nutritious coconut water, the coconut itself offers the white flesh; both freshly eaten and dried. 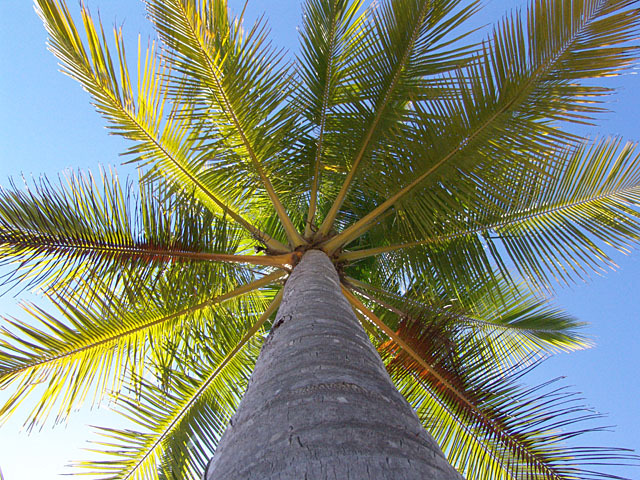 Coconut oil is extracted from the flesh as well. With the coconut fibers ropes, mats and brushes are made. With the shells also parquet is made. 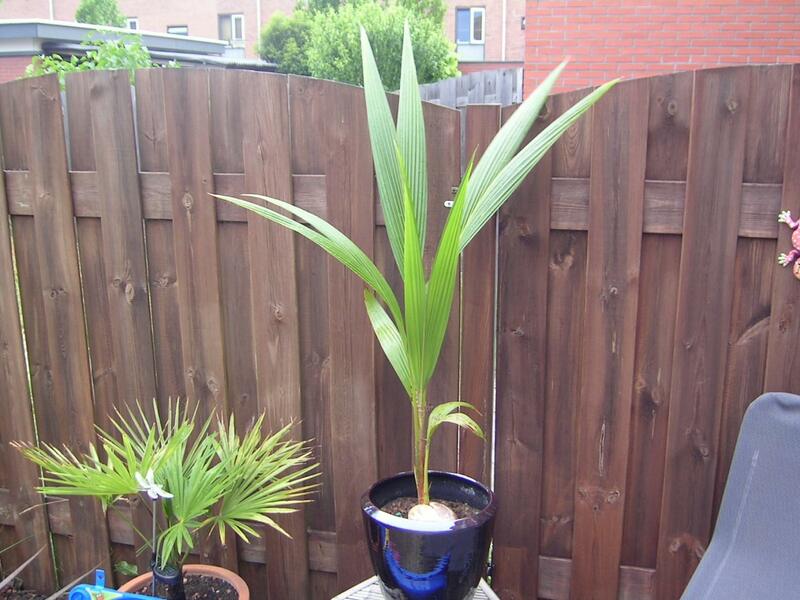 Composted coconut waste forms the well known Cocopeat that we find in the garden centers.